This superb collaboration between Marky, Makoto and Sonic finally sees the light of day with this release. A dance floor friendly monster, “Holy Tuesday” starts off with some sensational rhodes chords and a harmonized vocal chorus, but quickly transforms into a dirty, heavy, dance floor destroyer. After the drop, a ridiculously fat hoover bass line rips through the tune and is simply guaranteed to tear up any dancefloor at any time. 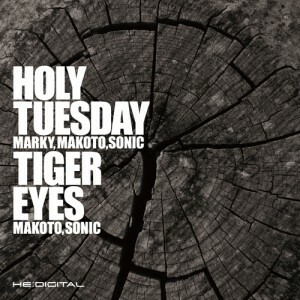 Tiger Eyes is a unique tune from Makoto and Sonic which has a distinct traditional Japanese flavour. A combination of hectic breaks and classic Japanese drums and samples form the basis for a dark, moody tune that is quite simply, spectacular. Fans of Photek’s earlier works should definitely pick this one up as well as anyone interested in hearing the simplicity and beauty of Japanese culture captured through modern electronic music. ブラジル – 日本 – イギリスの3国タッグによる奇跡のコラボレーションが実現。 3人それぞれの持ち味が遺憾なく発揮され、美しいイントロから突如ダンスフロアーを揺 さぶるスリリングでエネルギッシュな展開はドラムンベースならでわ。正真正銘のフロ アーキラー!